UPDATED: Norway’s chess federation is evaluating another attempt to wrest away the rights to hold the World Rapid and Blitz Chess Championships from Saudi Arabia. The federation’s challenge is not tied to Norwegian chess star Magnus Carlsen’s loss in the first round of this year’s competition in Riyadh or his later victory in blitz chess. Both Carlsen and Norwegian officials were relieved when he made a comeback on the last day of the most recent tournament. “It means an enormous amount,” Carlsen told Norwegian Broadcasting (NRK) after winning another world championship title in blitz chess. “Things didn’t look very bright after several heavy days, so it was fantastic to clinch this,” he said, and win back the trophy he lost two years ago. His victory also helped ease the pain of losing his championship title in rapid chess on Thursday. The Norwegians otherwise remain disturbed by allegedly secret dealmaking between their international counterpart, FIDE, and Saudi officials. They’re unhappy over reports that FIDE already has laid plans to arrange more world championships in Saudi Arabia, which is often at the center of international controversy over brutal punishments, restraints on women’s freedom and human rights violations. The Saudis’ current world championships, which ran through December 30, have already raised protests after Saudi authorities refused to grant visas to Israeli chess players and delayed granting visas to players from Iran and Qatar. Israel’s chess federation has demanded that FIDE drop plans for tournaments in Saudi Arabia, while website chess.com noted that the choice of Saudi Arabia as a venue violates FIDE’s own regulations. They call for FIDE tournaments, congresses and meetings to be arranged by chess federations in countries that can ensure free access for representatives from all federations. Both Grønn and federation president Morten Madsen are disturbed by the sheer uncertainty around venues for future championships. “We’re unsure to what degree these (rapid and blitz) championships have been granted,” Madsen told Oslo-based newspaper Aftenposten earlier this week. He fears decisions have already been made without other federations being informed. “The question now is how chess folks around the world will manage to mobilize to change (any such) decisions,” Madsen told Aftenposten. He confirmed that Norwegian chess officials were also skeptical that this year’s championships are being held “in a country with limitations,” not least regarding who’s allowed to play because of visa restrictions. “We would also have gladly seen that FIDE arranged the world championships in a more democratic country,” Madsen said. Kjell Madland, chairman of the annual Norway Chess tournament, tried unsuccessfully to host this year’s rapid and blitz championships in Stavanger. 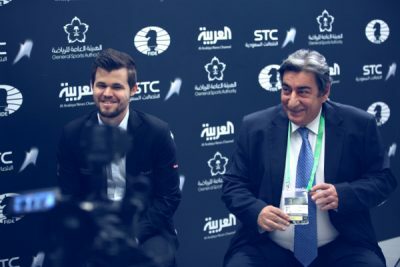 He was keen to try again for next year, but now fears he’ll have to drop those plans, not least since FIDE’s Makropoulos keeps praising Saudi Arabia’s event and claims that it “can generate friendship and peace” around the world. FIDE’s website has also been full of photos of women players in conventional western dress, with one caption stressing that there was “no need” for them to cover their heads and faces “during the games or in the hotel.” They did have to agree, however, to wear long trousers or skirts and tops with high necks, according to reigning rapid and blitz champion Anna Muzychuk, who refused to participate in the tournament. The Ukrainian champion preferred to risk losing her titles, and forego the biggest cash prizes ever, than compete in a country where she’d have to wear an abaya to cover herself and be escorted by a man if she ventured outside the tournament area. Carlsen had just as many points as arch-rival Vishy Anand before the last round, but NRK commentators claimed Carlsen’s “brilliant head didn’t function like it should when he needed it the most.” Carlsen said he didn’t know why he played so relatively poorly in the last round of rapid chess. Carlsen could remain inspired, however, by his “magical” rating in blitz chess, with 2,986 points. NRK noted how that’s more than 100 points higher than his closest competitor and just 14 points away from the 3,000 mark. No chess player has ever crossed it before. The blitz action got underway on Friday, with Carlsen saying tht he “just needed to sleep a bit” before it began. He must have slept well, since he rebounded to win the blitz championship. He called the tournmanet tough “both mentally and physically,” and said he felt like he’d been “punched in the face” many times. The last day of competition, however, began with an important victory over Grisjtsjuk. NRK reported how after that, Norway’s chess genius was back in stride and impossible to stop. He ended up claiming eight of 10 possible victories and only two ties.